The staff and management of Underriner Motors are dedicated to assisting our community. Throughout our 74 year heritage we have strived to help individuals, families and organizations in need of support. Our vision for a strong community is based on the belief that each of us, when working together, is capable of achieving valuable results. As professionals, we appreciate the fact that our business has been successful not simply because of our efforts, but because of your continuing trust. As members of the Billings community, we also understand that with the help of each individual, we will achieve the goals we set for future generations. We are who we are because of the values instilled in us by those who have gone before us. In 1944, Floyd Whitaker and Whitaker Buick introduced a family commitment to quality that has transcended time. The Whitaker family’s dedication to serving our community with the finest automotive products and services established a standard of excellence unmatched during its time. 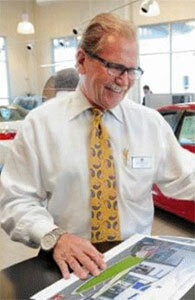 In 1955, George Selover – Floyd Whitaker’s son-in-law – started his career with Whitaker Buick. During 1966, Mr. Selover took ownership of the company and changed its name to Selover Buick. Mr. Selover endorsed the family vision of placing customers as the company’s first priority. As a result, the family business expanded and built upon the confidence and trust that comes with satisfying each customer… one at a time. During 2001 Mr. Selover retired, transferring ownership to his son-in-law, William Underriner who has been associated with the business since 1984.